KTZE and GT deployed hundreds of intermodal GT Smart UNIT45 reefer containers. 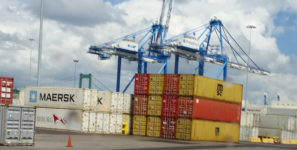 Reefer units will transit the long trade route from Chongqing, China, to Duisburg, Germany. KTZE/GT system is built to handle the harsh winter environments in Kazakhstan and Russia. Kazakhstan Temir Zholy Express ( KTZE), a provider of transportation and logistics for China’s New Silk Road, and global supply chain visibility specialist Globe Tracker International (GT), announce the deployment of hundreds of intermodal GT Smart UNIT45 reefer containers. The assets will travel along one of the longest rail trade route journeys in the world from Chongqing, China, to Duisburg, Germany. “We have worked hard with Globe Tracker and UNIT45 to develop this unique system for our valued customers and we couldn’t be happier with the results,” said Daulet Kakim, container transport department director of KTZE. KTZ Express provides a full range of transportation and logistics services on Eurasian routes, integrating rail, sea, air, and road transportation, port and airport infrastructure, warehouses, and a network of terminals across the world. KTZE is also the dry port operator and the management company of the Special Economic Zone Khorgos – Eastern Gate on the border with China. Globe Tracker is a privately held Danish company and a global provider of sensor-based tracking, monitoring, and supply chain analytics solutions specializing in cold chain, security and visibility.